On this page we gathered some english information for you. Don't hesitate to use the contact form below if you have any questions! The upcoming Baron and Baroness of Knight’s Crossing, Wolf and Catalina, will be invested during Red & Gold in August. See Kalender for Details of the event. Knight’s Crossing is a Barony of the Society for Creative Anachronism, Inc., an international organization dedicated to researching and re-creating the arts and skills of pre-17th-century Europe. Our “Known World” consists of 20 kingdoms, with over 30,000 members residing in countries around the world. Members, dressed in clothing of the Middle Ages and Renaissance, attend events which feature tournaments, royal courts, feasts, dancing, various classes & workshops, and more. 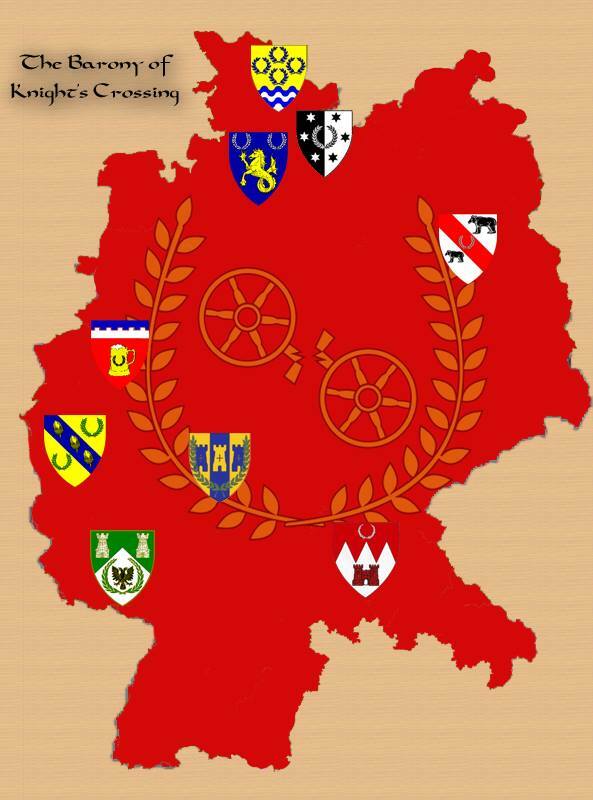 Our Barony covers most parts of Germany as you can see in the map. We have several local cantons and are happy to bring you in contact with the one next to where you live. In Knight’s Crossing we are doing many different arts & sciences, Heavy Combat and fencing. We meet at different events like the training event Bootcamp in March, the bigger Nibelungen War in Summer and many smaller or bigger events throughout the year. Also most of the local groups have regular meetings for chatting, handicraft or training.